Hooray for air conditioning and refrigerators! We don’t really stop and consider how fortunate we are to have them until our popsicles melt and heat stroke sets in. 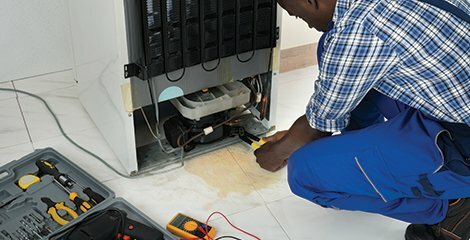 Sometimes when refrigerators, freezers, and air conditioning systems are repaired, PVE (polyvinylether), an oil used in refrigerant systems, finds its way onto the floor underneath. If you have a porous type of flooring, such as natural stone, the stain this oil leaves behind can be difficult to remove with your average stone-safe cleaner. Before you break out any heavy-duty chemicals that could damage your stone, we have a few DIY suggestions for you to try before you have to call in a pro. If you have the time, motivation, and patience to deal with the problem on your own, here are a few options that are good for this and any type of oil-based stain. All of them involve creating a poultice to remove the stain. A poultice is a paste that you can spread over the stained area that draws or wicks the stain out of the stone. Diatomaceous earth or a poultice powder can be mixed with a number of different chemicals to create your poultice solution. Regardless of your poultice ingredients, your poultice should be the consistency of peanut butter. Apply the poultice solution directly onto the stained area and an inch or two beyond. Put plastic wrap over the covered area. Blue tape works well to keep it in place. Wait 12-24 hours. After that, remove the plastic and let it completely dry. We suggest you perform a test in a small inconspicuous area first, if possible. Consider mixing the powder with a tool cleaner, but only if it is not acidic. Acidic substances chemically react with the calcium in natural stone, resulting in etch damage. If you don’t get the results you want, mix the poultice powder with acetone or a butyl-based degreaser. The ingredients will list this as “butoxyethanol.” This substance is commonly used in high-powered concrete cleaners, such as the heavy duty “purple” cleaners. Just be careful and use gloves/wear glasses, because the pH will be very high. Also make sure that the dye that is added doesn’t make your poultice too colored, because it can be transferred to the stone. Add some water to lighten the color of the poultice, if needed. If you get a stain to “move” or lighten, that is good news. This process can be repeated as many times as necessary to completely remove the stain. To learn more about mixing and applying a poultice, visit Stone and Tile PROS’ Stain Removal Application. And of course, if you feel like you are in over your head and would rather entrust this difficult stain to a professional, give your stone restoration technician a call.